What if you discovered that you had the power to change the world? 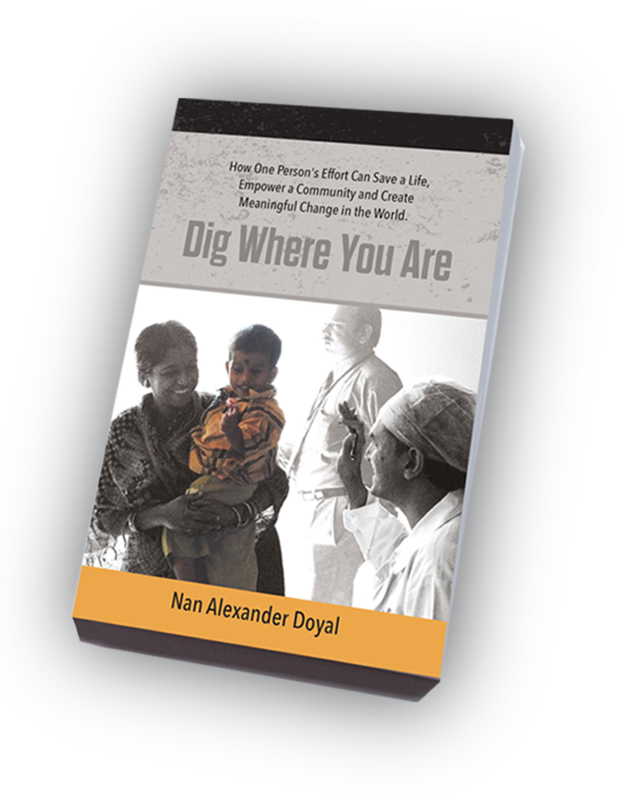 For anyone who has ever wondered if what they do matters or how they might make a difference but doesn’t know where to start– Nan Alexander Doyal’s voice is what you’ve been waiting for. In her book Dig Where You Are she introduces us to seven men and women who have solved some of the biggest challenges facing our societies today. Their stories are entertaining, heart-breaking, inspiring and at their core, empowering. From the slums of Mumbai, the villages of Tibet and northeast Thailand, the inner cities of Philadelphia and San Francisco, and a ghetto outside Stockholm, Dig Where You Are tells of an artist, a surgeon, a teacher, a criminologist, an economist, a community organizer and a general physician each of whom saw a way beyond suffering and injustice, took responsibility for the wellbeing of others and ended up transforming lives and communities across the world. Proceeds from the sale of the book go to the men and women of Dig Where You Are.